Rubin Andre Carter (born May 12, 1979) is a former American football defensive end who played in the National Football League (NFL). He played college football for the University of California, and was a unanimous All-American. The San Francisco 49ers selected him with the seventh overall pick in the 2001 NFL Draft, and he also played for the Washington Redskins, New England Patriots and Oakland Raiders. Carter was born in Denver, Colorado. He attended Oak Grove High School in San Jose, California. As a senior, he was a USA Today All-America high school selection, and the Gatorade California Player of the Year. He was also rated as the top defensive lineman and a high school All-America selection by Parade magazine. Carter attended the University of California, Berkeley, and played for the California Golden Bears football team from 1997 to 2000. During his junior and senior years he was a first-team All-Pac-10 selection. As a senior in 2000, he won the Morris Trophy, awarded to the Pac-10's top defensive lineman, and was recognized as a unanimous first-team All-American. In addition to being selected as the Golden Bears' most valuable player, Carter was also a finalist for the Bronko Nagurski Trophy, given to the nation's top defensive player. Carter was selected by the San Francisco 49ers in the first round of the 2001 NFL Draft. Because the 49ers used a 3-4 defense under Head Coach Mike Nolan, Carter was moved to outside linebacker. While playing for the 49ers, he made 154 solo tackles, 32 sacks, and 12 pass deflections in 69 games. 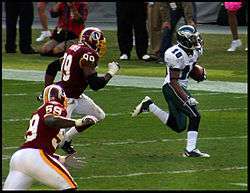 Carter (#99) giving chase to DeSean Jackson during a 2008 game versus the Philadelphia Eagles. Carter signed a six-year, $30 million contract with the Washington Redskins as an unrestricted free agent on March 14, 2006. The Redskins moved Carter back to defensive end, his natural position. In his first year with the Redskins, he had 56 total tackles and six sacks. He showed much improvement in 2007, with 55 tackles, 10.5 sacks, and four forced fumbles. He also had a safety in a 34-3 win over the Detroit Lions. Carter's best season as a Redskin came in 2009 when he totaled 11 sacks. However, in 2010 the Redskins hired a new coach, Mike Shanahan, who changed their 4-3 defense to a 3-4 defense which required Carter to play outside linebacker. The Redskins released Carter on March 1, 2011. Carter announced on his Twitter page on August 7 that he will be playing for the New England Patriots in 2011. It was later confirmed by Ian Rapoport of the Boston Herald and Michael Lombardi of the NFL Network. According to Rapoport, Carter signed a one-year deal with a base salary of $1.75m. He also received a $500k signing bonus and the chance to earn another $500k in incentives, making the contract worth up to $2.75 million. On November 13, 2011, Carter had a career game against the New York Jets, recording 4 sacks and tying the Patriots single game sack record. On Sunday, December 18, 2011 while playing against the Denver Broncos, Carter tore his left quadriceps tendon and missed the remainder of the 2011 regular season as well as the playoffs, as he underwent surgery. Despite being injured, Carter was one of eight Patriots honored by a selection to the 2012 Pro Bowl. On September 26, 2012, the Oakland Raiders announced they had signed Carter. On April 9, 2013 Carter re-signed with the Raiders on a one-year deal. On August 31, 2013, He was released. Carter re-signed with the Patriots on October 22, 2013 to add a veteran presence to a Patriots defense that lost Vince Wilfork and Jerod Mayo to season-ending injuries earlier in the season. In August 2015, Carter returned to California as an undergraduate assistant. Carter is the son of former Denver Broncos defensive tackle Rubin Carter. He has a wife, Bethany, and two children: stepdaughter, Aysha, born in 1993, and a son, Quincy, born in 2007. His middle name was given to him by his father who named him after his close friend and teammate Andre Townsend. ↑ "2010s All-AFC Teams". profootballwriters.org. ↑ Fitzgerald, Gary (March 1, 2011). "Redskins Release Carter, Dockery". Redskins.com. Retrieved 2012-09-18. ↑ "Raiders sign DE Andre Carter". ESPN.com. September 26, 2012. Retrieved 2012-09-26. ↑ "Andre Carter signs contract with Oakland Raiders". NFL.com. September 26, 2012. Retrieved 2012-09-26. ↑ "Raiders Re-sign Andre Carter". Raiders.com. April 9, 2013. Retrieved 2013-05-21. ↑ "Andre Carter cut by Raiders". timesheraldonline.com. Retrieved September 1, 2013. ↑ "Raiders cut Carter, keep 4 QBs and 2 punters". sfgate.com. Retrieved September 1, 2013. ↑ "Andre Carter Stats". ESPN Internet Ventures. Retrieved 8 January 2014. Wikimedia Commons has media related to Andre Carter.